Walter Hewlett is the son of William and Flora Hewlett. He has served as a director of the Foundation since its founding in 1966 and as the chairman of its Board since 1994. He is on several other boards of directors, including Vermont Telephone Company; the Packard Humanities Institute; and the Public Policy Institute of California. He served on the board of directors of the Hewlett Packard Company from 1987 to 2002, and of Agilent Technologies from 1999 to 2006. Mr. Hewlett is a member of the Advisory Board of the Stanford Institute for Economic Policy Research and the Advisory Council of the Stanford School of Humanities and Sciences. 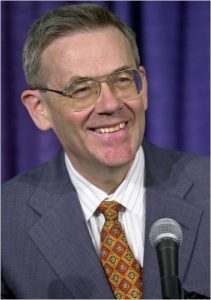 He was chairman of the Stanford Library and Information Technology Advisory Council from 1996 to 1998. He served as a member of the Harvard Board of Overseers from 1997 to 2003 and of the Stanford Board of Trustees from 2003 to 2008. He is a member of the American Bach Society Advisory Board, co-chair of the Study Group on Musical Data and Computer Applications of the International Musicology Society, and co-editor of Computing in Musicology. Mr. Hewlett is a fellow of the American Academy of Arts and Sciences and serves on the Academy Trust. He is also a member of the American Philosophical Society. Mr. Hewlett received his A.B. in physics from Harvard University. He also has an M.S. in engineering science, an M.S. in operations research, and a D.M.A. in music, all from Stanford University. Here he discusses the origins of the Foundation, the role of foundations in society, and the Foundation’s style of grantmaking. The Hewlett Foundation is nearly forty-five years old. What were your parents thinking in 1966 when they established the Foundation? My parents realized that the Hewlett-Packard Company was on track to become a very large and successful company, and that their ownership in the company would become quite valuable. They did not want their children to inherit a lot of money, because they believed that having too much money could alter lives so radically as to ruin them. They also were egalitarians. While the Hewletts made a lot of money in Hewlett-Packard stock, they realized the real work was done by the employees of Hewlett-Packard. It’s a quirk of our system that some people get super-rich starting a company, whereas the work and creativity are contributed by lots and lots of people. In a very fundamental way, my parents understood that and felt a responsibility to give back to society. How was the Foundation organized at the beginning? For the first five years or so, we simply got together every now and then to conduct the Foundation’s formal business. The Foundation’s assets were not large, and my father, who already had a program of personal philanthropy, would make occasional gifts to the Foundation to augment this. There wasn’t any real process involved. But soon enough, my father decided that if this was going to be a real grantmaking foundation, its processes should be more formal. My father had served for several years on the board of the San Francisco Foundation and had developed a high regard for its director, John May. When John retired from that position, my father tapped him to be our executive director. Soon after, the Board was expanded, and the basics of a more formal structure were put in place. How was the Foundation’s grantmaking different then? At first, it wasn’t organized in a strategic way. There were no discussions about strategic goals: What are we trying to accomplish? How do we measure success? Those kinds of questions weren’t asked then. We were simply giving back to the community. There were many good causes to support, and we were trying to spread the money around where the need was. But my father eventually realized he didn’t want a foundation like that. The Hewlett Foundation would one day have a big enough block of money to ask the question, “What can we do with these funds to really make a difference?” He wanted our grantmaking to be more strategic. That was the second big change. The decisions of those early days were very important and still inform the Foundation’s grantmaking. Thirty percent of our grant dollars went to support higher education, 20 percent to improve and protect the environment, 20 percent to address population issues, and 10 percent each to advance performing arts, local philanthropy in the Bay Area, and special projects. We wanted to make it very clear to the grantee community what it was we were trying to do and the kind of grants we wanted to make. The role of our Board of Directors in this process was to set strategic goals and priorities for the Foundation, rather than sponsor individual projects, as is done in some foundations. By following a clear process in our grantmaking we hoped to avoid as much as possible sending conflicting or confusing signals to our potential grantees. Also in those years, we introduced the idea of term limits for program officers. Without limits, it’s very natural for a program officer to settle on a way of doing things, which can rob a foundation of one of its most important assets: the ability to react to new situations, new evidence, new problems, in ways that other institutions in our society cannot. What are some of the Foundation’s accomplishments that you’re particularly proud of? I’m most proud of the way the Hewlett Foundation goes about its business. I think that trumps everything else. Of course, we and our grantees have been able to do some wonderful things, which I am very proud of. But I believe our greatest achievement happens each day in the way we conduct ourselves in our work. And I think that’s what my father wanted more than anything else: he wanted people to point to this organization and say that it’s a really well-run foundation doing good things. It’s a great institution. And what are some of the key elements that make the Foundation what it is? I think one important factor is the size of the staff. From early on, we wanted to stay small. If you’re small, your people can interact with each other, and there’s a free flow of ideas. You avoid the bureaucratic silos that large organizations often have. Another is our guard against self-satisfaction. People are always saying nice things about you when you give them money. That can lead to an internal perception that all of the really smart people are foundation insiders and that they understand problems better than anyone else. That’s a huge danger for any organization giving away money. The fact is, grantees are the ones that have most of the knowledge, and they’re the ones doing the work. So it’s best to stay small, push the money out, and grant some leeway to the organizations you’re giving money to so they can decide the best way to use it. That’s one reason the Foundation likes to make grants for general support. Many of these ideas were first articulated by the Foundation’s first president, Roger Heyns. Another idea he put forward was the importance of building and supporting institutions. He was thinking about institutions of higher learning, such as the University of California or Stanford University. But he was also thinking of institutions in the broader sense: such things as promoting the rule of law, promoting transparency and accountability in government, strengthening public education as an institution in society, and strengthening organizations in the nonprofit sector. It is through these institutions that a society is able to raise itself up from disorganization and disfunction. So supporting great institutions has become an important goal in itself for the Foundation. For example, if you’re working on population issues and you find a grantee doing really good work, you try to find ways to strengthen the organization as a whole, instead of simply funding a specific project. That’s probably the best bang you can get for the buck. What role do foundations play in the larger world of philanthropic giving? Large foundations account for something like 7 percent of all philanthropic giving; the vast majority of it comes from individuals. The problem with individual giving is that it’s scattered. You can’t round it up to take on certain kinds of tasks. So foundation giving is unique in that it can be done quickly and in relatively large amounts. And for something like saving the Great Bear Rainforest, that’s exactly what is needed. If you had to go out and raise that money from many small donations, even a project that worthwhile never could have succeeded. So foundations have a responsibility to take on large projects like that from time to time. You have often said that humility is important in the culture of a foundation, and that we need to learn from experience. Can you say more about that? We’ve made mistakes, and I’d say they were honest mistakes. By that I mean that we followed a process but the process failed us. Sometimes the timing of a grant wasn’t right. Sometimes the idea wasn’t a good one. Sometimes the problem was so intractable that it wouldn’t have mattered what anyone did. There is this saying in the foundation world: foundations are society’s risk takers. We’re still mulling that over to see what we really mean by it. But we believe it should be a role of foundations to try things that haven’t been tried. Who else will if foundations don’t? And if you try things that haven’t been tried, sometimes your efforts will fall short. At the Hewlett Foundation, we are not afraid to take risks. Our grantmaking is based on the potential impact we think we can have, not on the risk of success or failure. You don’t want to make the same mistake twice, but you also don’t want to become overly concerned with how you appear to others. That can make you tentative. The important thing is to focus on the problem you’re trying to solve and give that your best effort. I think we’ve failed more than once as a result of staying with something for too long, being unwilling to look at bad news and thinking success is just over the next hill. It can be easy to think, “Well we haven’t tried for long enough.” How do you know when to stop? Speaking more broadly, how do you see the role of foundations in society? I think our modern society is seriously threatened by some very large, multigenerational problems that need to be addressed. Otherwise, the world could fall into chaos, and the things we love so much about our modern civilization could be lost. And what are these things we value and want to preserve? There are many: culture, a good standard of living, the health and well-being of the world’s population; the opportunity for everyone to make something of him- or herself. Modern civilization has advanced a long way, but there is no guarantee that these advances will continue. With the world’s resources being consumed at a rate faster than they can be replenished and with a fragile, ten-mile thick atmosphere that if severely disrupted could take hundreds of years to fix, the prospects for our future are uncertain indeed. We also live under the threat of an unprecedented act of terrorism. There are groups of people in the developing world who feel so deprived of opportunity that they have become suicidal toward modern society. With nuclear weapons still numbering in the thousands, and the security of these weapons and this technology not yet fully assured, we are but one “incident” away from a catastrophic change in the way our advanced society functions. So I see the Hewlett Foundation as trying to make progress on solving those problems. That explains our commitment to work on issues in population and global development, our work on the environment, our interest in nuclear security, and our investment in the institutions of education. Taken as a whole, if you look at the places where we make our grants, they tend to be in those areas that increase the likelihood that we and our children will live in a society that continues to improve, develop and thrive.